Connie – We sympathize with you. When all of your teeth are missing, eventually the jawbone shrinks, because the body senses that the jawbone is no longer needed to support your teeth. The minerals from the jawbone are resorbed and used elsewhere in your body. You are experiencing jawbone shrinkage and facial collapse. At some point, as you have already discerned, you will no longer be able to wear dentures. But you have some options. You can find an affordable dentist who offers implant dentures at a competitive price. Most dentists offer payment plans and financing. The first step is bone grafting to rebuild the missing jawbone. 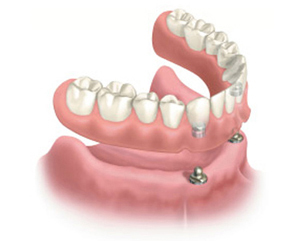 After you receive bone grafting and your jawbone heals, dental implants can be placed. The more implants you have, the more stable the dentures will be, and they will function better. Dental implants help prevent jawbone shrinkage and facial collapse. You can also receive complete removable dentures again. But be aware that in another twenty years or so, you will experience the same problem with facial collapse. Find a cosmetic dentist to provide you with natural-looking dentures. You can schedule consultations with at least two dentists who are experienced with dentures and dental implants. You want quality implant fixtures and quality placement of the implants to prevent complications that will cost even more money to correct. Ask each dentist how dental implants and dentures can be made affordable for you. This blog post is sponsored by Plano female cosmetic dentist Dr. Miranda Lacy. Previous PostWill my free teeth whitening match the fillings on my front teeth?Next PostHow can I get my wife to stop requesting sedation at the dentist?